THINK CINNAMON BUN MEETS FRENCH TOAST! This is super easy to make for one and perfect for a late night sweet craving! The sprinkled cinnamon-sugar on the outside of the soaked bread caramelizes and gives this french toast extra crunchy goodness. In a bowl or dish (that is large enough to soak the bread in) whisk together the egg, milk, and vanilla. Spread cream cheese on both slices of bread and sprinkle the cream cheese with cinnamon-sugar (how ever little or much you like) and "sandwich" the 2 pieces together. Soak the bread in the egg and milk mixture for 30-60 seconds per side. 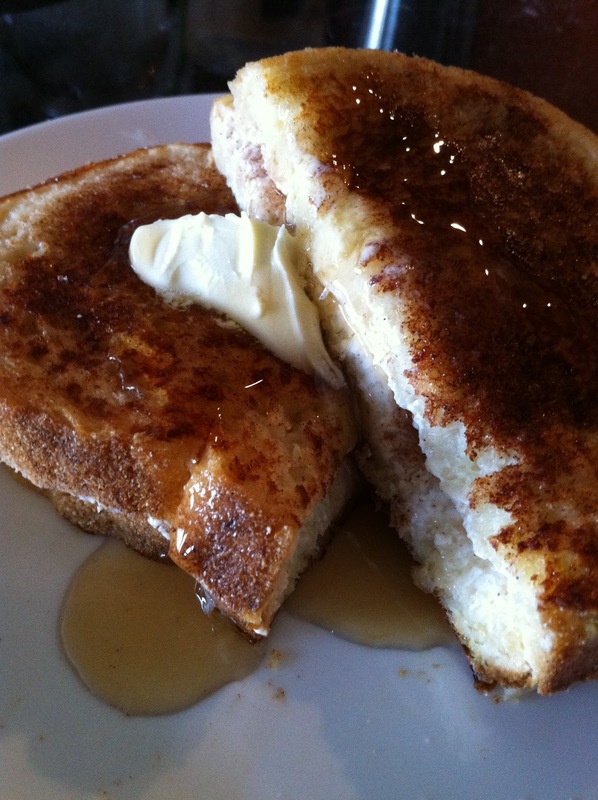 Sprinkle cinnamon-sugar on the outside of both sides of the soaked bread. Spray the pan with non-stick spray and cook the soaked bread in the pan for 3-5 minutes or until brown. Flip and cook the other side for 3-5 minutes or until brown.